The christening of my Goddaughter is this coming Sunday so it is high time for the quilt I started last week to be finished. But before I show you the finished piece I would like to answer Sarah Witherby's question from pingandneedles because I think it might be interesting for everybody. Sarah wondered if it wasn't easier to first piece strips together and then cut 60 degree diamonds in order to avoid piecing so many diamonds. I did a test on paper as you can see in the two images below. 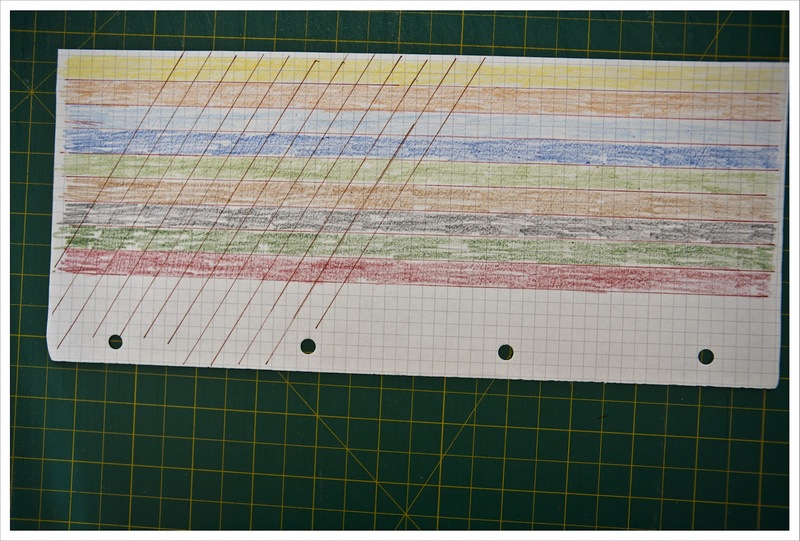 The first image shows you a piece of paper that simulated 9 coloured strips sewn together. 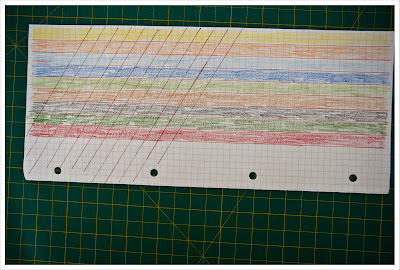 I then drew 60 degree lines and cut strips. The second image shows you the arranged strips in the same pattern I did with the quilt. My conclusion is that yes it is possible to do this but and it is a BIG but you end up having to sew in the end pieces (see overlarge arrow) as inset seams (something called Y seams) and you also end up with an awful lot of leftover fabric as you want to achieve a square or rectangle format (see blue rectangle drawn). 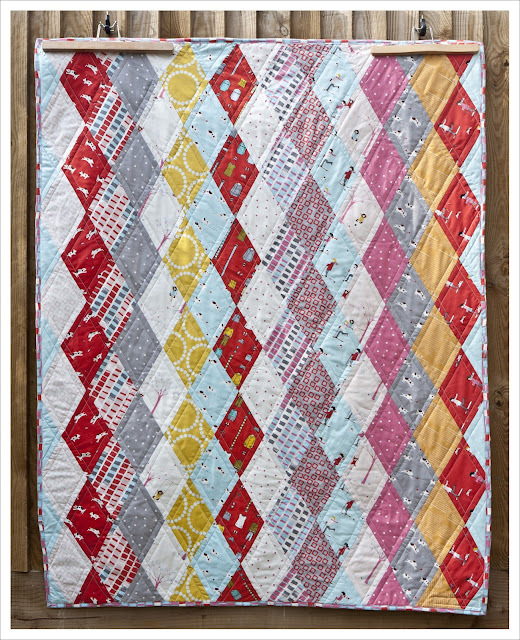 I constructed my quilt by first cutting strips, then individual diamonds from the strips that I then lay out until I had a pleasing arrangement. I added the end and corner pieces and then sew the diagonal strips together thereby avoiding inset seams. I also don't think it is more difficult to sew diamonds together then for example squares or HST squares. 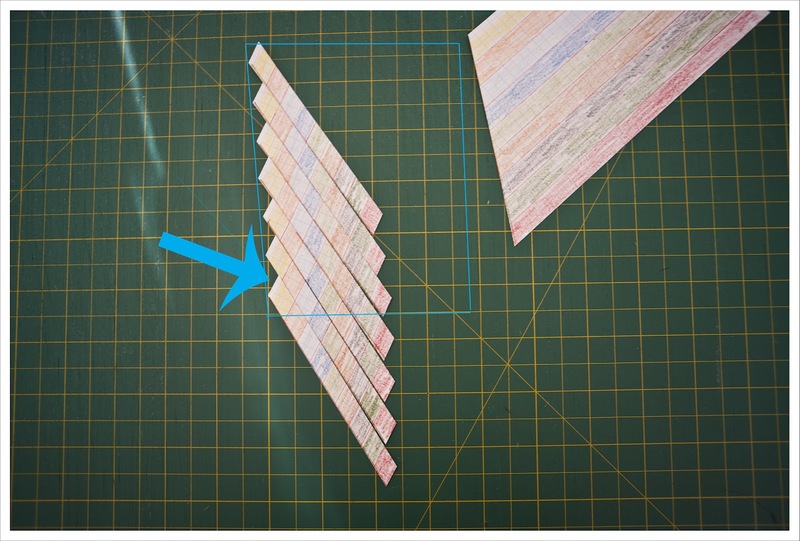 The only thing that is a bit more tricky is to accurately meet the seams and to avoid stretching the bias cut diamonds. But I honestly didn't have many problems at all and will do this pattern anytime again. For the front I used mostly the 'Sherbet Pips' collection but added three other prints, mainly the yellow ones to offset the pinks, reds and blues. Now, I am not a friends of girly pink colours but somehow got carried away with them for the back. I don't know what gotten into me but I really like it. 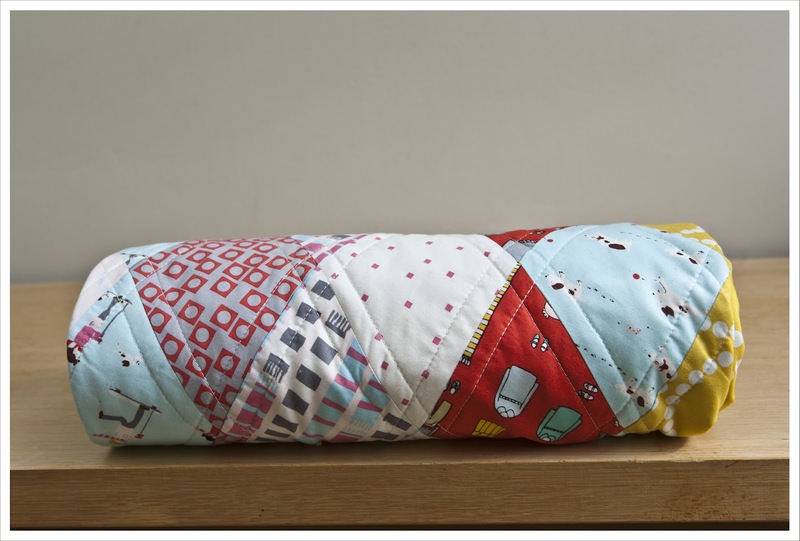 The quilt is 41 x 53 inches and I quilted with Gueterman Sulky in my favorite soft white 1071 colour. The quilting pattern mirrors the diamonds. 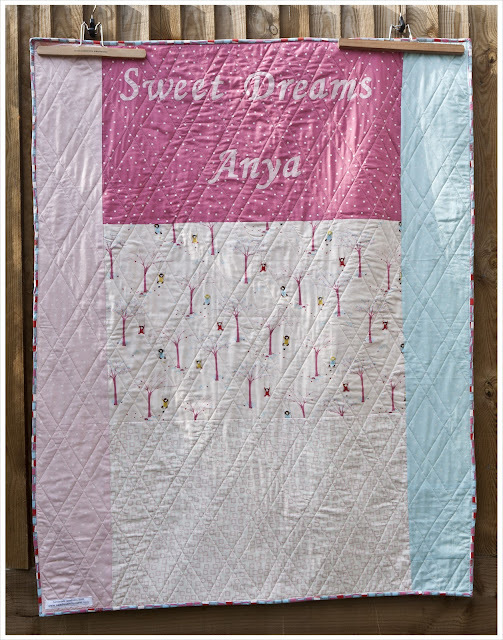 I added raw edge applique on the back to form a little good night message for Anya. 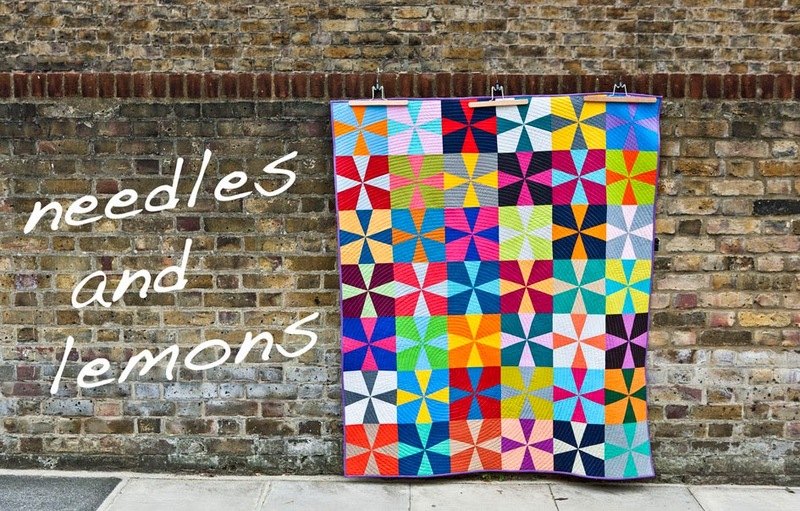 I really enjoyed sewing the diamond pattern and I will definitively use it again soon. Let's hope Anya likes the quilt too. It's gorgeous! This will definitely become an heirloom quilt. 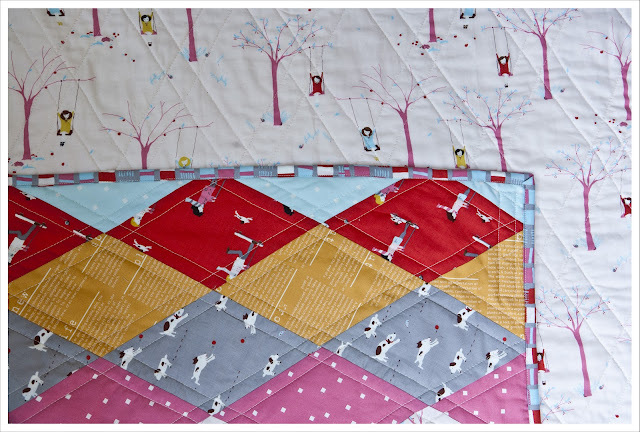 what a cute and pretty quilt! Going back to your second photo...you would not have to stitch any Y seams if enough strips are stitched together and the top cut out from the middle (this means there would be some wastage). It's a gorgeous quilt. Wish I had got one when I was christened 30+ yrs ago, instead I got a bible. It's beautiful and so personal. I love it. Thanks for the comparative tutorial, too. This is incredible!! I adore it! The pattern looks wonderful in those prints and the back is too cute.